In a large pot, cook the potatoes in salted water till soft. In the same pot, start mashing the potatoes while still hot. Add generous knobs of butter and cream while mashing. Adjust seasoning and add more butter if necessary. Set the potatoes aside and allow to cool. While cooling, arrange the flour, eggs and breadcrumbs in different bowls, ready for shallow frying. When the potatoes have cooled, shape the mash into desired shapes (ball/ cubes) and set aside. Coat the potato balls in flour, then egg and, lastly, bread crumbs. Repeat breadcrumbs if necessary. 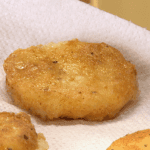 Shallow fry the potato balls in vegetable oil at 284 degrees Fahrenheit till golden brown. Remove when crispy and drain the excess oil on paper towel.